With Custom Effects we can at personal touches to your website by adding buttons to the navigation, inserting background designs, or even just personalize one of our pre-made templates with your businesses marketing colors. Click here to fill out our "custom work form" or you can see some of the Custom Effects below. 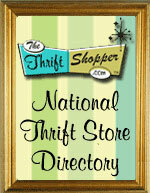 We can personalize any of our templates to your thrift store color scheme. Do you support a specfic charity and want your template to reflect their colors? We can do it! We can even use your images for a picture set! Available only to you!